Chrysanthemum Flower (Chrysanthemum morifolium) is consumed as a tea to nourish the Yin and as an herb to remove wind and occasional heat (irritation) from various areas of the body in normal, healthy individuals. For thousands of years it has been used in Asia. Today, it continues to be one of the most commonly consumed herbs in Asia, consumed by millions of people every day as a delicious, satisfying health beverage. It is China's quintessential summer tea because of its cooling effect on the body, especially the face and head. Tens of millions of cups are consumed every day during the hot months of summer. According to traditional Chinese herbal theory, Chrysanthemum's functions include nourishing Yin, dispersing ascending false Yang, dispersing wind and minor, occasional irritation (especially from the face, head and upper body), and calming and cooling the liver in normal healthy individuals. This delicious flower is most famous for its ability to support vision and eye health. It is widely used to brighten the eyes, improve vision and to clear minor, occasional irritation from the eyes. It helps to support the natural healthy moisture and coolness of the eyes. In Asia, it is used for minor, occasional eye strain, soreness and redness in normal healthy individuals. It is very widely used by those who experience mild, occasional dry eyes or redness due to irritation by dust, wind and outside temperature increases by normal healthy individuals, especially in the summer time. Chrysanthemum flower tea can serve a very useful purpose in a tonic program. Since it is a normal human process, especially as we grow older, for "heat" (false yang) to rise in the body, an herb that can modulate this rising heat can be very important to maintaining normal healthy functions and maintaining a youthful appearance. Chrysanthemum is among the most important of the herbs used for this purpose (Gynostemma being the other great tonic herb that accomplishes a similar result, though not quite as directly as Chrysanthemum). Chrysanthemum, especially when combined with Gynostemma, can provide considerable balancing effect for those people who like to consume warm tonic herbs (such as Ginseng, Astragalus and Deer Antler) and feel some rising heat, especially in the hot months. 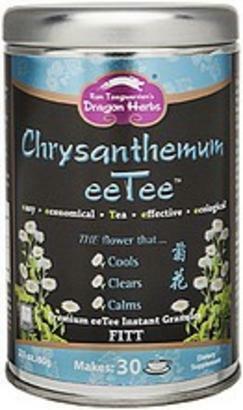 Thus, Chrysanthemum Flower eeTee is a smart product to have on hand by those on full tonic programs. Chrysanthemum is also used in Asia to clear the mind. Consuming a relaxing cup of Chrysanthemum tea at bedtime is believed to improve one's memory, especially when memory is overtaxed by mild, occasional overwork or stress, or due to too much thinking, reading, worry and/or computer work. Consumed during the day or in the evening, it helps relieve stress and tension in normal healthy individuals. Chrysanthemum Flower is renowned for its benefits to the skin, as it supports healthy moisture content and helps prevent wrinkling due to dryness, wind and heat. It is one of the Orient's premier beauty herbs. The Chrysanthemum used as an herbal tea is a special kind of Chrysanthemum. The flower buds are tiny and yellow, and the tea made from these flowers has a distinctive flavor. Like all major herbs, many varieties of Chrysanthemum flower are available, some being of very high quality and some not so much. "High quality" refers to the subtle richness of the flavor, as well as to its effectiveness as an herb in terms of benefiting the Yin, in cooling the head, eyes and face, and for its effect on the skin and mind. Chrysanthemum flower has a massive connoisseur following throughout Asia (tens of millions of people), much like tea (Camellia sinensis), so the source and variety of the flowers really matter. Ron and Yanlin Teeguarden consider Chrysanthemum flower to be of such health value, that they have made numerous special trips to various growing sites in China to determine the best Chrysanthemum and to obtain these flowers for its Chrysanthemum Flower eeTee™. There is a Chrysanthemum-growing region about one hundred miles outside of Nanjing that is renowned throughout China for its extraordinary Chrysanthemum tea flowers. It is considered the supreme Di Tao source of Chrysanthemum flowers in China. Of course, this is where Dragon Herbs obtains our annual harvest of sweet Chrysanthemum flowers to produce Chrysanthemum Flower eeTee. 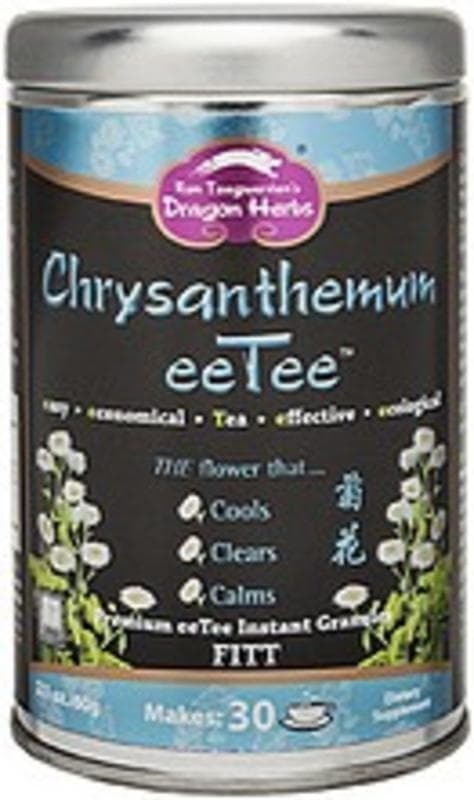 Suggested Use: 1 teaspoon of Chrysanthemum Flower eeTee™ powder per cup of water (hot or cold). It is traditional, though optional, to add several Goji berries to this tea. Chrysanthemum Flower eeTee™ may also be added to Spring Dragon Longevity Tea, which has Gynostemma as its main ingredient. This makes a formidable Yin tonifying tea that will provide an amazing overall cooling effect, especially useful in the summertime. The acronym eeTee™ stands for "easy, economical, effective, ecological Tea." An eeTee™ is a cutting edge, proprietary instant extract that preserves the natural freshness and potency of herbs and teas, and dissolves instantly in water of any temperature. It is 100% natural. The core technology is known as Fingerprint Identical Transfer Technology™ (FITT™). Essentially, the herb (in this case, Chrysanthemum flower) is extracted in room temperature water (no heating) by an array of physical forces. As a result, the finished tea extract (called eetee™) has the identical phytochemical profile as the raw herb. Because the extract is never heated above 104ºF, the eeTee™ is a genuine raw food. Chrysanthemum eetee™ is the only raw, completely full spectrum, natural chrysanthemum powdered extract in the world. The phytochemical fingerprint is virtually identical to that of the fresh raw flower. Consuming Chrysanthemum Flower eeTee™ is like eating the raw Chrysanthemum flowers straight off the bush in the field, but a lot more convenient. This is herbalism at its finest. Specifications: 2 grams per serving, 30 servings. Usage: Mix with water hot or room temperature, stir or shake until the powder completely dissolves. For iced tea, use room temperature water to dissolve the powder first then add ice. You may flavor the tea with sweeteners, fruits, or herbal tinctures. You may also adjust the amount of Chrysanthemum eeTeeTMto your liking. Chrysanthemum flower, maltodextrin (a binding agent, enzymatically derived from plant starch. may contain a trace amount of corn or wheat). Mix with water hot or room temperature, stir or shake until the powder completely dissolves. For iced tea, use room temperature water to dissolve the powder first then add ice. You may flavor the tea with sweeteners, fruits, or herbal tinctures. You may also adjust the amount of Chrysanthemum eeTee to your liking. 2 gm per serving, 30 servings.